Human Performance on the Flight Deck Book. Taking an integrated, systems approach to dealing exclusively with the human performance issues encountered on the flight deck of the modern airliner, this book describes the inter-relationships between the various application areas of human factors, recognising that the human contribution to the operation of an airliner does not fall into neat pigeonholes. The relationship between areas such as pilot selection, training, flight deck design and safety management is continually emphasised within the book. It also affirms the upside of human factors in aviation - the positive contribution that it can make to the industry - and avoids placing undue emphasis on when the human component fails. The book is divided into four main parts. Part one describes the underpinning science base, with chapters on human information processing, workload, situation awareness, decision making, error and individual differences. Part two of the book looks at the human in the system, containing chapters on pilot selection, simulation and training, stress, fatigue and alcohol, and environmental stressors. Part three takes a closer look at the machine (the aircraft), beginning with an examination of flight deck display design, followed by chapters on aircraft control, flight deck automation, and HCI on the flight deck. Part four completes the volume with a consideration of safety management issues, both on the flight deck and across the airline; the final chapter in this section looks at human factors for incident and accident investigation. The book is written for professionals within the aviation industry, both on the flight deck and elsewhere, for post-graduate students and for researchers working in the area. This human performance on the flight deck book is supplied as un-certified representative training equipment. 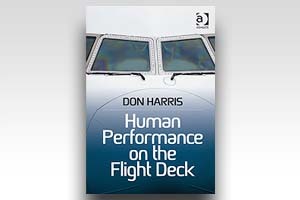 Looking for a Human Performance on the Flight Deck Book for flight operations end use? We're here to help with all of your equipment needs. Not only with this Human Performance on the Flight Deck Book but any other parts, equipment and reference training devices that you may require.